Vecna was a powerful wizard who became a lich. He was eventually destroyed, and his left hand and left eye were the only parts of his body to survive. Even after he achieved godhood he is still described as missing both his left eye and left hand. 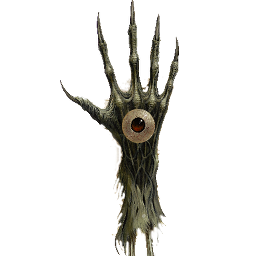 Vecna’s holy symbol is an eye in the palm of a left hand. Vecna’s “right hand man” and then ultimately his betrayer, is Kas the Bloody-Handed, a vampire, whose sword, the Sword of Kas is also an artifact. Vecna is usually depicted as a powerful magician resembling a desiccated corpse missing his left hand and eye. Vecna has few allies, and countless enemies. His greatest, and perhaps only true ally, is the mysterious entity known as the Serpent. The famed cambion lich Acererak once served Vecna, but the current status of their relationship is unknown. Among Vecna’s staunchest foes are Kas, Iuz, Saint Cuthbert, the Lady of Pain, Pholtus, the Circle of Eight, and is opposed by the Old Faith and the Silent Ones. Vecna’s main foes in the realm of death and undeath are Kas, Orcus and the Raven Queen (though he would rather she rule the dead than Orcus). Among the gods, Ioun is something of Vecna’s antithesis, for she would share with the world all the knowledge he would keep secret. Being a secretive cult, there are no real collections of Vecnan teachings. However, copies of the Book of Vile Darkness are highly prized by the cult for Vecna’s role in that work’s development. Vecna’s cult is very secretive, and cells have been uncovered, at various points in history, in Diamond Lake, Greyhawk, and Verbobonc. Temples to Vecna have also been reported in the Pomarj town of Highport and Erelhei-Cinlu, the debased city at the heart of the Vault of the Drow. Each position in Vecna’s cult is named for a certain body part. At the top is Vecna himself, followed by the Voice of Vecna, which can only be filled by Vecna’s manifestation. Next is the Heart of Vecna, the high priest of the cult. The last known Heart of Vecna was Diraq Malcinex of Ket, who was slain by adventurers a dozen years ago in 581 CY. Immediately below the Heart of Vecna are two bizarre monsters known as the Hand and the Eye. The Eye of Vecna creature appears as a slender humanoid with an eyeball for a head, whereas the Hand of Vecna appears as a stocky humanoid with a huge left hand where its head should be. Individual congregations are known as organs. Each organ is led by a Thought of Vecna. Lesser priests are known as Memories of Vecna. Lay members of the cult consist of the Teeth, Fingers, Blood, and Spawn of Vecna. The Teeth of Vecna are made up of wizards, and specialize in arcane spellcasting and crafting magical items for the cult. The Fingers of Vecna consist mainly of thieves, who engage in various forms of subterfuge. The Blood of Vecna are mainly warriors charged with protection and enforcement of the cult and its goals. The Spawn of Vecna are the lowest in the cult hierarchy, and consist of the common people who honor the Lich Lord. Other Vecnan organizations are known to exist outside of the mainstream cult, and some may have similar or identical names. Relations between these groups and the mainstream cult may vary. Known examples are the Eyes of Vecna (a cult of undeath consisting mainly of rogues), the Fingers of Vecna (Vecna’s personal guard), and the Ebon Triad. Vecna’s left hand and eye of Vecna’s original “mortal” lich form, which have never been replaced in his later more powerful incarnations, are now high-valued and very dangerous magical artifacts. To use the powers of the Hand of Vecna or the Eye of Vecna one is required to cut off one’s own corresponding body part and affix Vecna’s in its place. Vecna created the Sword of Kas for his greatest servant, which contains a “portion of his consciousness.” This interpretation is relatively recent. Vecna only procured this most powerful sword for his chief lieutenant and it is undoubted that the Sword is inextricably tied to Vecna’s relics. A number of Vecna’s other body parts are presented as minor artifacts, including the First Digit (right thumb), Second Digit (right index finger), Third Digit (right middle finger), Last Digit (right pinky finger), Incisors (a pair of inappropriately named fang-like canines), Molar, Scalp, Skin, Heart, Foot (left), and Right Eye. These artifacts are collectively known as the Fragments of Vecna. The Compendium Maleficarum is a book of spells, doctrines, and secrets crafted entirely from bone (even the pages) and penned in blood, that is on par with the Fragments of Vecna. The Tome of Shared Secrets is an illustrated bestiary of relic status, with the ability to impart knowledge of dark and evil creatures at the cost of a portion the user’s life force. The Rod of the Whispered One, while not nearly so powerful as the Sword of Kas, is another item Vecna crafted to connect himself with his highest lieutenants. The “Left Ear of Vecna” is a minor artifact. It grants the owner magical hearing and resistance to sonic attacks, spell-like abilities to inflict deafness, grant clairaudience and create sonic blasts, and enables them to understand any spoken language. A lich known as Osterneth is said to possess the “Heart of Vecna”. The Head of Vecna was a hoax that one adventuring party played on another. One of the groups tricked the other into going on a quest for the Head of Vecna, a hoax artifact that was supposedly similar to his Hand and Eye, but was simply an ordinary severed head. The hoax takes advantage of the fact that the Eye and Hand require a person to remove their own eye or hand and replace it with the artifact to function. The characters involved reasoned that they needed to decapitate themselves to gain the powers of the Head of Vecna, and several members of the group actually fought over which character would get to have his head cut off and replaced. After the third character died, the joke was revealed. Vecna was born as a human, centuries ago as a member of the untouchable caste in the Flan city of Fleeth on Oerth. He was initially trained by his mother, Mazzel, in the art of magic, before she was executed by the government of Fleeth for practicing witchcraft. Vowing revenge, Vecna eventually assumed a mastery of the dark arts achieved by no mortal before or since. Some say this achievement was due to direct tutelage by Mok’slyk the Serpent, believed to be the personification of arcane magic itself. Nearly one thousand years after his birth, Vecna, now a lich and ruler of a great and terrible empire (in the Sheldomar Valley, centered near the modern-day Rushmoors), laid siege to the city of Fleeth with an army of arcane spellcasters and undead. Legend has it that Vecna was nearly slain in this battle by clerics channeling the power of Pholtus, the god of light. The clerics unleashed a great burst of light, which hit Vecna primarily on his left side. Vecna was rescued and brought to safety by one of his wizard generals, a cambion named Acererak (who would one day himself become a mighty demilich). Vecna eventually recovered. On the verge of conquering Fleeth, the officials of the city came before him to beg for mercy. They offered up the entire city and her wealth if only Vecna would spare the lives of her citizens. When Vecna was not satisfied, the officials offered their own lives. Vecna gave one of their number, Artau, and his family, over to his lieutenant, Kas, who spent the entire day torturing and murdering them before the other officials. Still unsatisfied, Vecna slaughtered all within the city, and had their heads stacked before the officials, with those of their family members prominent. Vecna then granted his mercy, granting the officials leave to depart, and promising them his protection for the rest of their lives. At his empire’s height, Vecna was betrayed and destroyed by his most trusted lieutenant, a vampire called Kas the Bloody-Handed, using a magical sword that Vecna himself had crafted for him, now known as the Sword of Kas. Only his left hand and his eye survived the battle, perhaps because of the previous events in Fleeth. Vecna did not stay gone forever, and rose as a demigod of magic and secrets in the world of Greyhawk. In 581 CY, his cult helped set events in motion that would have granted him the power of a greater god, but the plan was ultimately foiled. After these events, Vecna ended up imprisoned in the demiplane of Ravenloft, but broke free again later, emerging with the power of a greater god, after absorbing the power of Iuz. He then broke free into the city of Sigil, where he came perilously close to rearranging all existence to his whims. When Vecna was ejected from Sigil by a party of adventurers, Iuz was freed and Vecna returned to Oerth greatly reduced in power, though still a lesser god. Vecna’s machinations allowed him to reappear on the prime material plane and retake his place in the Oerth pantheon. At some point in his history, Vecna penned a tome known as Ordinary Necromancy. He is also rumored to have made significant additions to the Book of Vile Darkness. Although not actually penned by him, the Book of Keeping (a book of Yugoloth summoning) is heavily linked with the cult of Vecna, as the cultists have the only known copies that are free of the intentional errors introduced into the book by the fiends that wrote the volume as a trap for would-be summoners.